One of my favorite songs to play at Christmas time – “How to Make Gravy” by Paul Kelly….. it’s a bit sad, but nothing says Christmas quite like the drawl of Paul Kelly singing about some guy stuck in prison, longing to be with his family on Christmas day, and wondering who’s going to make the gravy, now that he’s incarcerated. …..just add flour, salt, a little red wine and don’t forget a dollop of tomato sauce for sweetness and that extra tang….. Put margarine in a saucepan and saute the onions and garlic over med-high heat until cooked. Reduce heat. 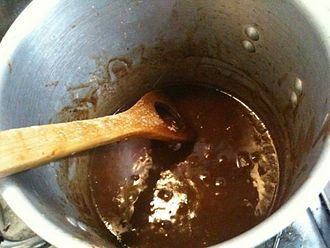 Make a roux by gradually adding the flour, while continuously stirring to avoid lumps. Still stirring, add garlic powder, mixed herbs, soy sauce and stock to the mixture. Add a dollop of tomato sauce and red wine to taste; to be an authentic Paul Kelly fan. Simmer until the gravy has reached desired thickness, turn off the stove and you are done!